The most pretty jhoola decor ideas for your mehndi ceremony! A mehendi function is incomplete without the bride sitting on a beautifully decorated jhoola. We’ve got some really pretty jhoolas for you so that you can add the Bollywood quotient to your mehendi as well! 1. The use of white and pink flowers with no extravaganza looks super pretty! 3. 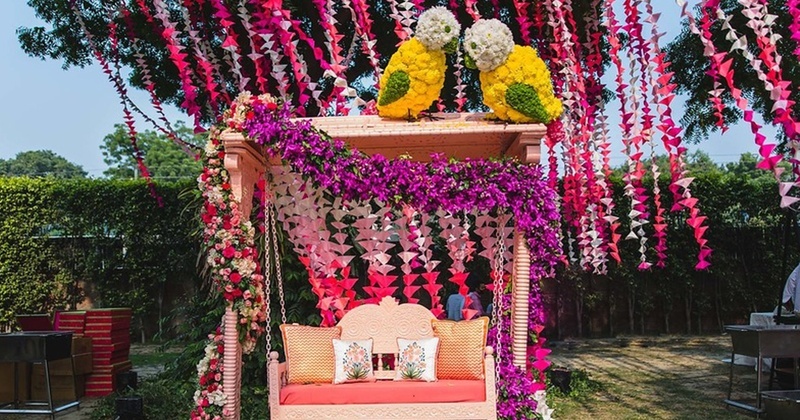 A canopy made out of genda phool with a board that spells ‘dulhaniya’. Uber cool! 5. Orchids and white flowers give this jhoola a refreshing look! 6. Decor props made out of paper cuttings add the perfect drama to this jhoola! 7.This jhoola is decked with flowers and goes in sync with its colourful surrounding! 8. Another single jhoola but decorated with leaves and flowers give it a ‘coachella’ look. 10. The hues of yellow and purple uplift this plain jhoola very well! 12. This circular jhoola with delicate white flowers and gentle tendrils makes looks pretty! 14. The concept of decorating jhoolas with fake leaves and minimal flowers is catching up! 15. A single jhoola totally that is decked with genda phool. The cushion steals the show! Turning a pumpkin into a chariot sounds difficult, but turning a plain jhoola into a Instagram-worthy one doesn’t! Draw inspiration from each and design your very own jhoola for your mehendi!